Leyton came back to continue to share his life’s journey through a world filled with paranormal events including contact with other world creatures. 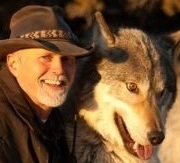 Leyton is presently the director of a wolf sanctuary in New Mexico. He grew up as a farm boy with an amazing love for all types of animals. His life in the 80’s was the spirit journey with five Native American medicine men, learning about the spirit of nature and the nature of spirit. 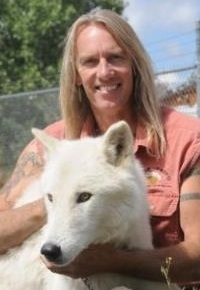 Today he cares for captive bred wolves and wolf dogs and some very rare dog breeds, the New Guinea Singing Dogs. He is a gifted animal communicator and has a pack of nine dogs that help other dogs find mental, social, and physical rehabilitation. He also assists people with spiritual issues and he is a guest for many spirit retreats and seminars. There were other things on his mind though this time as he told us about some of his very uncomfortable experiences with ET type entities. From the age of 4 he had these strange experiences. His memories included a babysitter female (he thinks) who looked like an Octopus in a dress and wanted him to eat a bologna sandwich. Later he had been shown a nursery of Asian-looking babies in drawers. Also as a little kid he was shown some horrific stuff, unspoken events, some in the form of sexual acts and death- (I will leave the details out for this blog). He spoke of brain implants he felt he had in the 60’s and 70’s and still may have. At times he felt he had someone else in his body and his body would occasionally transfer into what he called a dangerous creature, (this was perceived in the dream-state). Even though he felt nothing good came to him from these strange experiences, I would say they enhanced his ability to perceive the world around him in a totally more real way and communicate with nature in a way few humans have done. Sleep tight – there is something to be said about the Light and the Dark in our world. Last week I traveled to Portland Oregon, to visit with two of my daughters and my grandson. The trip was great, and something synchronistic happened on the way to Portland. 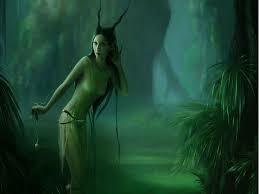 I was finishing a posting for this website which was about the Australian Aboriginal concept of Dream-time. It was part two of a two- part series. I wanted an aisle seat so I asked at the gate counter, and they offered me an aisle seat in the last row of the plane. As all you hardened air travelers know on a S-80 plane the engines are in the back, and it is extremely noisy in that area of the plane. So I kept thinking “no, don’t take the seat,” but my inner self said something interesting would happen. So I got to my new seat, and there was a nice couple from Australia next to me. They were outgoing and interested in who I was. So I told them who I was and what I did, including my 45 years in paranormal /UFO study. I have this conversation with strangers when I feel the listener would be interested and open to that type of conversation. And they were, in a big way. The woman had seen strange lights with a girlfriend near Sydney a few weeks before this trip to the US. And they ( the lights) truly sounded like the real thing. Next I had my camera with me where I had saved several dozens of vortex pictures of many strange beings including but not limited to fairies, brownies, ET types, and Bigfoot. The couple was amazing at picking out the beings/creatures. Not only did they pick all of them out of the digital photos, but they also found more than I had seen originally. They were both connected to the world of vortexes, even though they said they had never seen anything like this before. So now I found out why they knew of this special cosmic world of the vortex. 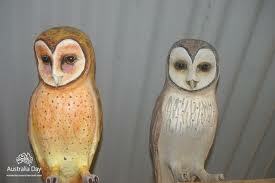 The woman from Australia was an Owler, defined as a person who sees many owls and enjoys seeing them. Since an Owl sighting is a rare event, I believe they are actually seeing a shape-shifting alien being, who is coming to visit certain humans and giving the humans the ability to access the unknown vortex, UFO and paranormal worlds. For our January meeting, we had a delightful visit from Leyton and Rory, who run an amazing wolf sanctuary in western New Mexico. They gave us a history about the sanctuary and several stories about the many wild wolves and dog wolves and a small group of domestic dogs that live and are protected on the sanctuary property. It sounds like a great place to tour and enjoy the beauty of that part of New Mexico. Both of these men have lived lives loaded with encounters with creatures/beings maybe even more a mystery than the wolves themselves. I must note that I have always thought of wolves as much more than canines, they are like sacred beings with amazing powers. I was talking to my dentist who is Muslim and talked about wolves in her culture as creatures that would control/kill evil Jinn. Jinn are creatures that are from the unseen, from another dimension, which can visit the earth dimension and cause harm to humans. Once the Jinn spot a wolf in pursuit the Jinn will die quickly at the hands of the wolf. So the wolf in that culture is a good being to have around. One of the sanctuary shepherds had UFO/Alien encounters as a small boy, almost like he was in training to take care of the wolves, this special group of beings. But not all his encounters with beings were good. He was shown the brutalization of humans, which caused total distress as he saw a woman be cut open by a lady in black on a UFO ship. He also fought with reptilians as they tried to hurt him and possibly his family. The other shepherds had many interesting encounters with Bigfoot in Washington, California, and New Mexico. But in these encounters all went well. This good outcome is driving him to have more encounters with the gentle giant hairy ones. 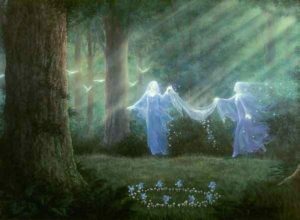 I predict that their encounters will continue for they possess the special energy and courage to face, the hidden and the unknown. The wolf in them will protect them from the Jinn. Sleep Tight, to fear is to be small, to be fearless is to be huge. JC Johnson is the man behind a courageous group of individuals who track down and research the scariest stuff on the earth, like incidents where several hunters in the southeast US were dragged down from their hunting tree stands and shredded to death. Of course being a bit of a Bigfoot researcher myself they (BF) are not that scary, just big and strange but generally friendly, as long as you give them space and not try to hurt them or their families. JC bought several people from his group and I can honestly say I liked them all. JC had impressive photos of two Bigfoot, both very tall say 12 to 16 ft range. One of the BF was fishing and the other standing on a hillside just watching the small humans watching him. There seems to be much Crypto activity in the four corners area. Some of the strangest activity moves around creatures they call Skinwalkers, they seem to take many forms, from witches, to werewolf types, beautiful humanoids, to the wee people. Many seem to have a transparent quality to them and red glowing eyes. The most dangerous are the ones that go beyond the scare, they kill farm animals and maybe just maybe people. I speculate that these creatures including the more human Bigfoot are passing through the numerous vortex/portals that exist in the Four Corners region. They come out of their dimensional portals, to play and raise hell. And sometimes it goes a little too far. JC has developed a great relationship with the local Navajo people and many of them understand the true nature of these creatures, because their folklore talks of the Crypto types for hundreds of years. Leonard Dan told an amazing story about these little people who wander around the four corners. They are 1 to 3 ft. tall and have been known to come to people doors asking for food and if you don’t give them some, they could and would mess with you. Leonard had an amazing photo of a little humanoid creature sitting on a rock by the San Juan River. Suddenly the little human type creature jumps in the water and starts swimming, but not in a manner of a small human being, but like a fish. 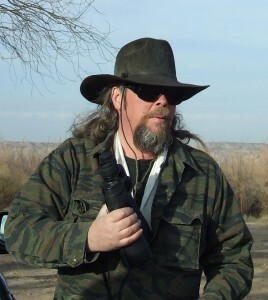 One of the most interesting things JC is involved with is working alongside other researchers and scientists and taking possible Bigfoot DNA samples to verify its existence to the world. All of details of this project are basically Top Secret, and there was a handler there at the meeting especially flown in to keep an eye on him (JC). Well JC, good luck on your project, I hope the world will handle their (BF) existence and not drive them (BF) to extinction, like we have done to hundreds of thousands of other creatures on earth. But remember the BF and the other Crypto beings can hide in another world where humans cannot go. Sleep tight; remember the scratching on the wall is just your imagination, but the Red glowing eyes are for real.